Data source: Pilot study on the feasibility of fever surveillance in hospital setting, K.W. Choi, 2009. 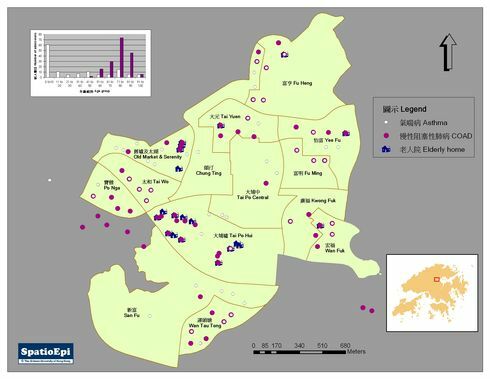 Map shows the home locations of patients presenting with shortness of breath at the emergency room of a hospital in Hong Kong over a three-month observation period. Though symptomatically similar, the geographic distribution of asthma (white circles and white bars) and chronic obstructive airway disease (COAD) (purple circles and purple bars) patients varied considerably. COAD is a chronic condition affecting older people. It is therefore not surprising that their locations often overlapped those of homes for elderly people (shown as houses in navy blue). In some cases, COAD and asthma co-existed (white circles with thick purple boundaries), which may suggest the same triggering factor for breathless attacks in the environment. 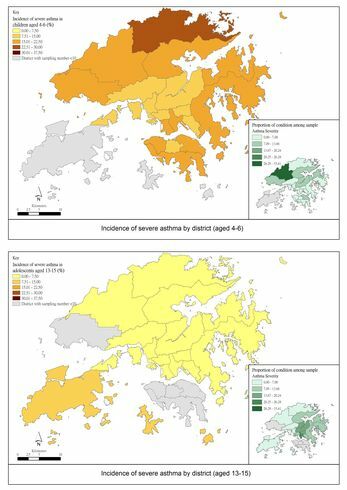 Data were extracted from the dataset of a pilot study on fever surveillance conducted at the Alice Ho Miu Ling Nethersole Hospital in Tai Po District in Hong Kong between September and December 2005. The light green areas are DCCAs (District Council Constituency Areas) in central Tai Po where most people in the District live. Chronic Obstructive Airway Disease (COAD) is also known as Chronic Obstructive Pulmonary Disease (COPD). Patients suffering from the condition present with difficulties in breathing. COAD/COPD commonly encompasses a combination of chronic bronchitis and emphysema. Breathing is a laborious activity, and patients breathe in a more exaggerated manner in order to obtain sufficient oxygen. Chronic bronchitis refers to the presence of inflammation of the bronchi in the lungs, which is associated with excess mucus secretion and coughing, lasting for prolonged period of time. Emphysema is characterized by the dysfunction or damage of lung tissues, as a result of which the air sacs and airways lose their normal function. COAD commonly results from chronic smoking. There is no cure for COAD. Medical therapy can relieve symptoms only.